Starting this week—April 3—CRNAs who recertified or initially certified in 2016 can log on and complete their next step in the CPC Program—the 2-year Check-in. Update contact information to be reached for important certification information. Pay the $110 credentialing fee for the upcoming two years—the same fee amount and timing as in the past. This quick and easy online process only takes about 10 minutes and can be completed from a computer, cell phone or other mobile device. Connect to the 2-year Check-in online portal. Your 2-year Check-in deadline will depend on your 2016 recertification or certification date. Find a 2-year Check-in deadline chart, FAQs, overview videos, and more at the NBCRNA website. Cesar Visurraga, MSN, CRNA, is one of 50 nurses spanning 21 specialties being honored for "Excellence in Nursing" by Baltimore magazine in its May 2018 issue. The honorees will be profiled in the issue and also celebrated at the fourth annual dinner and awards reception on Wednesday, April 18. Visurraga is being honored in the Acute Care/Family Practice/General Medicine category, as a CRNA providing excellent care in the Baltimore VA Medical Center/VA Medical Health Care System. The Medicare agency is requesting nominations for clinicians for the development of hospital-level performance measures for Patient-Reported Outcomes Following Elective Total Hip and/or Total Knee Arthroplasty (TKH/TKA). The primary objective of this project is to develop one to two Patient-Reported Outcome Performance Measures (PRO-PMs) for Medicare beneficiaries aged 65 or older who undergo an elective TKH/TKA. CMS is looking for clinical experts who have subject matter expertise in patient reported outcomes following TKH/TKA. If you might meet the agency's qualifications, please send a) your CV and b) 3 to 4 sentences highlighting your experience/knowledge relevant to the expertise described and involvement in measure development to AANA DC at info@aanadc.com by noon ET April 9 and include "Medicare Technical Expert Panel on Arthroplasty" in the subject line. TEP members will need to be available to participate in two to three teleconference meetings lasting 90 minutes each between March 2018 and September 2018. The TEP members will review materials provided in advance of the teleconference and review minutes and a summary report following each meeting. Learn more. The AANA and CRNA Financial Planning® have partnered to offer members fiduciary consulting services for retirement, tax and financial planning. Did you know that CRNA Financial Planning® is the only financial and tax planning firm exclusively serving CRNAs? It's true. For over two decades, we've made it our mission to help CRNAs. It’s our goal to help you move from confusion to clarity when it comes to utilizing your career path to meet your life goals. We work with CRNAs to educate and empower them to make sound financial and tax decisions. Understanding what you do and the opportunities available to your profession does make a difference!! Let our fiduciary team of CERTIFIED FINANCIAL PLANNER™ professionals show you how! A Free Copy of Our Book: The Wealthy CRNA, which features insights into becoming a financially successful CRNA and how to start planning for your financial future. 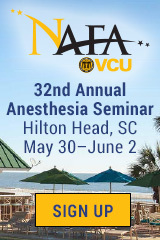 It has been prior approved for up to 4 Class A CE credits by the AANA. Get your copy now! Free Tax Evaluation for Business Owners & Freelancers: Speak with a member of our team familiar with the business of CRNAs to receive a tax evaluation and recommendations to lower your tax liabilities this year and in the future. Schedule a call now! Retirement Income Analysis for CRNAs Near Retirement: One of our CERTIFIED FINANCIAL PLANNER™ professionals will evaluate your Social Security benefits-when is best to take it? Pensions, Health Insurance Options, Sequence of Withdrawals to sustain your Assets. You have worked your whole life to be able to retire—We’re offering this service at an introductory rate of $249 so that you can have confidence in your decisions! Schedule a call now! Call our office at (855) 304-3748, schedule a call online now, or email. Researchers in Korea report that adding ropivacaine to serratus plane block (SPB) improved analgesia and recovery following video-assisted thoracic surgery. The study randomized 42 patients to ultrasound-guided SPB with ropivacaine after anesthesia induction and 43 patients to SPB with normal saline. All patients completed the 40-item Quality of Recovery (QoR-40) questionnaire one day prior to surgery and on both of the first two days after surgery. QoR-40 scores on both postoperative days were markedly higher in the ropivacaine group than in the control group. Patients who received ropivacaine also reported significantly lower pain scores at rest for up to six hours post-procedure, and they required fewer opioids in the first 24 hours postoperatively. From "Efficacy of Ultrasound-Guided Serratus Plane Block on Postoperative Quality of Recovery and Analgesia After Video-Assisted Thoracic Surgery"
Anesthesia & Analgesia (04/18) Vol. 126, No. 4, P. 1353 Kim, Do-Hyeong; Oh, Young; Lee, Jin Gu; et al. Researchers examined how the risk of infection from catheters changes over time of use. The study population included 44,555 surgical patients between 2007 and 2014 who underwent continuous regional anesthesia at one of 25 German centers. After adjusting for confounding factors, the evidence that showed catheter-related infection risk compounds the longer the equipment is in place. The threat is especially high, the investigators found, after four days. At that point, 99 percent of peripheral and epidural catheters were infection-free; however, the share fell after that. At 7 and 14 days, only a respective 96 percent and 73 percent of peripheral catheters were free of infection. The percentages were nearly identical for epidural catheters at the same timeline points. Based on the findings, researchers say infected catheters should be removed as soon as possible. From "Prolonged Catheter Use and Infection in Regional Anesthesia"
Anesthesiology (04/18) Vol. 128, No. 4, P. 764 Bomberg, Hagen; Bayer, Ina; Wagenpfeil, Stephan; et al. According to new evidence, greater occipital nerve block appears to effectively manage migraine. Nearly 600 patients were included in the retrospective cohort study, which covered the period from January 2009 to August 2014. Each was asked to measure their headache pain, using the numeric pain rating scale (NPRS), before receiving the block and then again at a follow-up visit within a month after the procedure. More than 80 percent of the patients reported a moderate or significant reduction in pain, meaning that their NPRS score dropped, respectively, by 31-50 percent or by 50 percent or more. Pain relief was especially high in patients who received multiple blocks, as opposed to those who underwent the procedure a single time only. Despite the study's limitations, including the retrospective nature of the work, the findings "are very positive in terms of the efficacy of [greater occipital nerve] block as a treatment option for migraine headaches," the researchers conclude. The results appear in the Journal of the American Board of Family Medicine. From "Efficacy of Greater Occipital Nerve Block for the Acute Treatment of Migraine Headache"
Blood samples from patients who had surgery under general anesthesia were examined as part of an analysis of neurologic outcomes in this population. The study group of 30 patients was drawn from two existing observational studies involving older adults. Blood taken before anesthesia administration was compared against samples extracted 30 minutes, 6 hours, 24 hours, and 48 hours postoperatively. In addition to a significant increase in neurofilament light following surgery, the researchers observed a substantial jump in plasma tau concentrations during each measurement from baseline. The biggest surge, 257 percent, was observed at six hours postoperatively, after which tau recovered to near-baseline levels but remained higher than normal for 48 hours. Investigators say their work points to "an increase in neurological biomarkers after anesthesia and surgery," which in turn suggests that neuronal damage has occurred. Future studies, they conclude, should explore whether identifying those biomarkers could be useful for early identification and management of neurologic decline. The analysis can be found in JAMA Neurology. From "Anesthesia, Surgery Affect Postoperative Neurological Outcomes"
Research has demonstrated a correlation between epidural anesthesia and increased survival after major surgeries, prompting Cleveland Clinic investigators to wonder if a reduction in the immediate complication rate is responsible for the improved longevity. The team designed a retrospective study around a sample population of patients who underwent epidural anesthesia for open colectomy. Although there did not appear to be a link between the technique and few post-procedure complications, there was a significant association with shorter length of stay in the hospital as well as with fewer cardiopulmonary complications, including myocardial infarction. Kenneth Cummings, MD, reported the results of the analysis at the 2017 annual meeting of the American Society of Anesthesiologists. "The findings support the longer-term observation that patients [who received epidurals] survive more, but also sheds a little insight as to why," he said. "Moving forward, this is the kind of hypothesis generation that would be the basis for prospective trials." From "Use of Epidural Analgesia in Open Colectomy Linked to Fewer Complications"
Evidence presented at the 2018 Society of Gynecologic Oncology Annual Meeting on Women's Cancer suggests some benefit from the use of liposomal bupivacaine during gynecologic abdominal surgery. The prospective study included 117 patients undergoing exploratory laparotomies, who were randomly assigned to receive either bupivacaine HCl or liposomal bupivacaine as part of a transversus abdominis plane block. Patients in the HCl group remained hospitalized for 2.08 days, while patients in the liposomal group were released after a median 2.93 days. While liposomal bupivacaine did not shorten hospital length of stay, it did appear to curb postoperative opioid use. Women treated with bupivacaine HCL consumed 56.25 morphine milligram equivalents of opioids in all, compared with only 37.50 among women treated with liposomal bupivacaine. According to the authors, "This study offers a potential way to decrease postoperative narcotic use and fits well into the Enhanced Recovery After Surgery goals in the field of gynecologic oncology." From "Gynecologic Abdominal Surgery: Liposomal Bupivacaine May Reduce Opioid Use"